Start off your visit on the 23rd (Tue): test your team's savvy at popular escape rooms and then take in the spiritual surroundings of Temple Square. To see other places to visit, maps, traveler tips, and more tourist information, read Salt Lake City tour itinerary builder tool . San Francisco to Salt Lake City is an approximately 4-hour flight. You can also do a combination of train and flight; or drive. You'll lose 1 hour traveling from San Francisco to Salt Lake City due to the time zone difference. Expect a bit cooler evenings in Salt Lake City when traveling from San Francisco in April, with lows around 42°F. 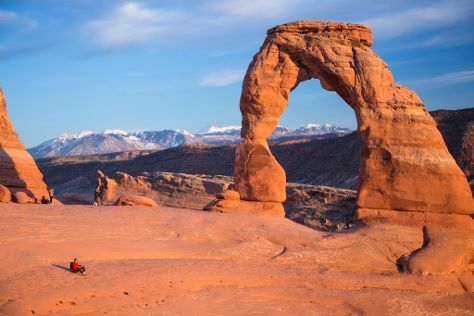 Finish up your sightseeing early on the 23rd (Tue) so you can travel to Moab. On the 24th (Wed), dedicate a day to the elevated beauty of Arches National Park. Make the 25th (Thu) an unforgettable day with an extreme tour. It doesn't end there: admire the majestic nature at Dead Horse Point State Park and take a tour by water with Boat Tours & Water Sports. To find ratings, more things to do, and more tourist information, go to the Moab online journey planner . Traveling by combination of flight and car from Salt Lake City to Moab takes 3.5 hours. Alternatively, you can drive; or do a combination of train and car. Expect a daytime high around 67°F in April, and nighttime lows around 38°F. Wrap up your sightseeing on the 26th (Fri) to allow time to drive to Monument Valley. Monument Valley is a region of the Colorado Plateau characterized by a cluster of vast sandstone buttes, the largest reaching 1000ft above the valley floor. Kick off your visit on the 27th (Sat): hit the best photo ops around with an inspiring photography tour, look for gifts at Monument Valley Navajo Market, and then explore and take pictures at Monument Valley Navajo Tribal Park. To see other places to visit, where to stay, ratings, and more tourist information, go to the Monument Valley road trip planner . Drive from Moab to Monument Valley in 3 hours. In April, daily temperatures in Monument Valley can reach 67°F, while at night they dip to 37°F. Finish your sightseeing early on the 27th (Sat) to allow enough time to drive to Bryce Canyon National Park. Kick off your visit on the 28th (Sun): get great views at Inspiration Point, then take in the pleasant sights at Paria View, then tour the pleasant surroundings at Navajo Loop Trail, and finally hike along Navajo/Queens Garden Loop. To see where to stay, other places to visit, traveler tips, and other tourist information, read our Bryce Canyon National Park online sightseeing planner . Traveling by car from Monument Valley to Bryce Canyon National Park takes 6 hours. Prepare for a bit cooler weather when traveling from Monument Valley in April: high temperatures in Bryce Canyon National Park hover around 56°F and lows are around 25°F. Finish up your sightseeing early on the 28th (Sun) so you can go by car to Zion National Park. Start off your visit on the 29th (Mon): explore the wealth of natural beauty at Zion National Park. Get ready for a full day of sightseeing on the next day: cruise along Zion Canyon Scenic Drive and then trek along Angel's Landing. To see traveler tips, photos, maps, and more tourist information, read Zion National Park journey app . Drive from Bryce Canyon National Park to Zion National Park in 3 hours. Traveling from Bryce Canyon National Park in April, things will get a bit warmer in Zion National Park: highs are around 69°F and lows about 35°F. Finish your sightseeing early on the 30th (Tue) so you can travel back home.